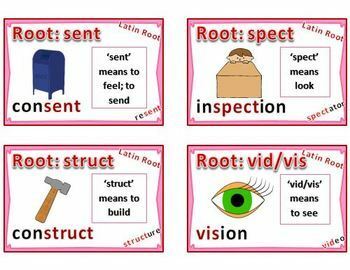 Latin root activities for matching each root to its definition, are in the form of an 'I Have Who Has' game, and a picture card set with its own set of game variations. This bundle also has an illustrated word wall for Latin roots. 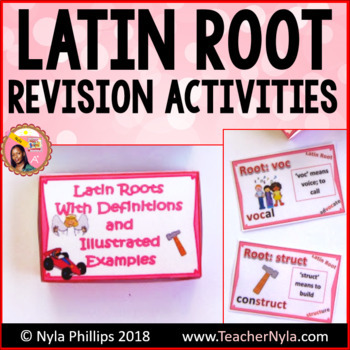 Latin Roots: Use this pack of Illustrated Latin Roots with definitions to keep your students engaged in fun activities that reinforce the definition of each Latin root with examples of words that take on the meaning of the roots that they contain. 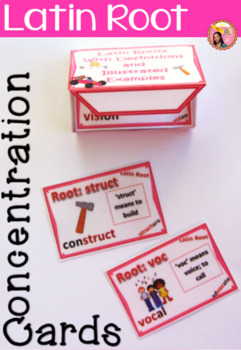 Instructions are included for two games your students can play with these cards; 'Say It, Keep It' and 'Root Buzz'. Over two dozen of the most commonly used Latin roots are used in these cards. They are: ambi, aqua, aud, bene, cent, circum, contra, counter, dict, duc/duct, fac, form, fort, fract, ject, jud, mal, mater, mit, mort, multi, pater, port, rupt, scrib/scribe, sec/sect, sent, spec, struct, vid/vis, and voc. I have a set for Greek Roots too! These cards are created in two different sizes. The original set has 8 cards per page and the larger set has 2 cards per page. The small set will save you ink and paper but many teachers have indicated to me that they preferred to have a larger set to make a bulletin board display. So, that's why I added the larger version. A storage box template is also included for these cards. 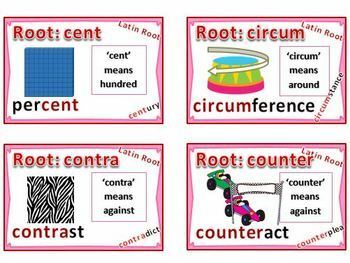 Latin Roots - Illustrated Examples and Definitions. Greek Roots - Illustrated Examples and Definitions. Greek Roots - I Have Who Has - Game.